For the average movie-goer, time travel is a frustrating concept in the world of cinema that leaves you with more questions than you started off with. Some may argue (myself included) that that is one of of the more fascinating aspects of the time travel equation: imagining the impossible. Looper is smart to stay off of the topic of time travel science mumbo jumbo for the most part, but also suffers a bit from this lack of detail. Looper stars Hollywood’s most recent comeback kid Joseph Gordon-Levitt as young Joe Simmons in the year 2044 and Bruce Willis as Joe from the future. Joe (Gordon Levitt) works as a looper: a mafia paid assassin that kill targets sent back in time from the future, where bodies are impossible to dispose of. Loopers are paid handsomely for their service with the full knowledge that one day they will have to kill the future version of themselves, thus “closing their loop,” a way of tying up loose ends for the mob in 2074. So the day comes when young Joe must close his loop and kill old Joe (Willis), but he fails to do so and old Joe escapes, which makes young Joe a target for his failure. (Get all that?) What follows is a tête-à-tête chase involving Gordon-Levitt and Willis’ characters as well as the mob that is hunting them both down. What we soon discover is that old Joe has a plan to take down the mob from 2074, by whatever means necessary. 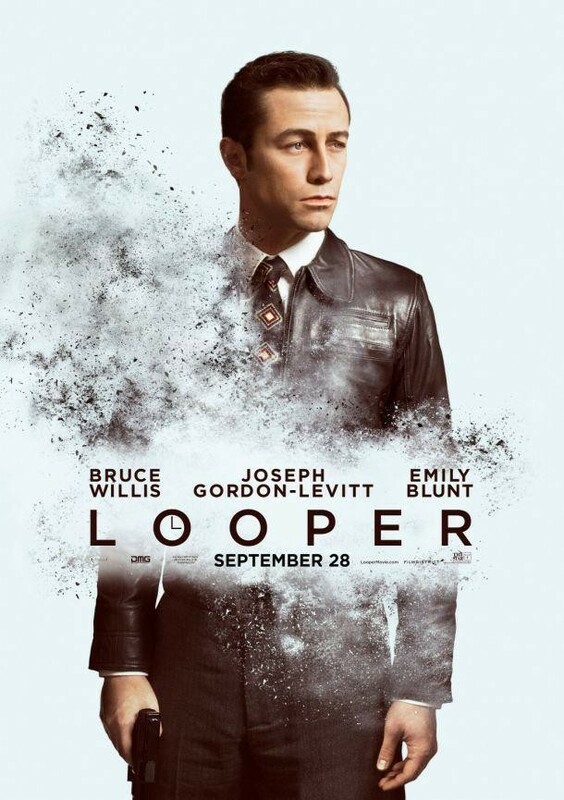 The film’s promotional campaign would have you believe that Looper had Willis and Gordon-Levitt sharing double billing, but most of the story centers on young Joe, with Willis in the background. The makeup that was used to make Joseph Gordon-Levitt look like a young Bruce Willis does an adequate job, as does Gordon-Levitt’s embodiment of the actor. The beginning of the film contains several voice-over monologues where Gordon-Levitt establishes the way of the world in 2044, using a whisper-like voice that strongly resembles Willis’. Unfortunately that story-telling technique is dropped about 25 minutes in, and young Joe’s vocal performance becomes less Willis-y and more Gordon-Levitt-y as it were. The film’s biggest mistake is introducing the element of a human mutation in the form of telekinesis, and a character essential to the plot who has this power. The story would’ve benefited from a larger emphasis on time travel than throwing the TK (cool people speak for telekinesis) curve ball. It is a lot of fun seeing Willis and Gordon-Levitt’s characters interact and the different perspectives each has on their life, but these scenes are few and far between. 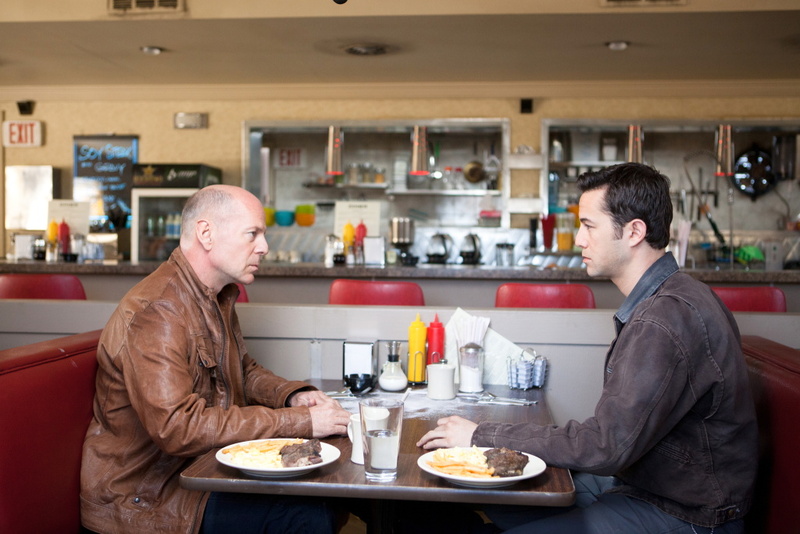 Looper suffers from lack of surprise, missed opportunities and uncertainty of what kind of movie it wants to be; with a strong start and a weak finish. I almost wish that it ended with Joe finding out he’d been dead the whole time. That might’ve made it more interesting.